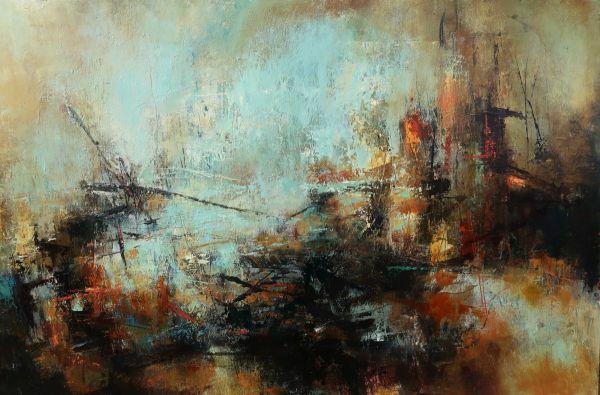 I Am Inspired - Gillian Lee Smith 20th October 2019 - 25th October 2019 - 5 nights residential art workshop holiday, 4 days tutorial with Gillian Lee Smith. Course Details: Since moving to the truly stunning, historic area of Northumberland, expressive and abstracted landscapes have become my way of exploring my love of this coastal area in my artwork. I am very much inspired by the spaces between land and sea – these coastal communities, the heritage of the area and the way humans have made their marks on the landscape. Beautifully worn cottages, harbour walls crossed with ropes, ladders and the line of the tide and the incredible vast space of sea and sky. There are also quite a few castles! I truly can’t wait to share this scenery and atmosphere with you as we explore the local area with sketchbooks and camera in hand and take our findings back to the workshop space to create our own interpretations in oil and cold was on paper. The beauty of oil and cold wax is that it dries quickly enabling you to build up layers quickly and expressively. Whether you are new to landscapes or a seasoned painter, drawn to abstraction or inspired to create more representational works you are sure to find something to spark a personal and expressive response to this rugged and inspirational landscape. Directions and Transport Information Springhill Farm is set 0.75miles from the coastal road, which runs between Seahouses (1 mile) and Bamburgh (3.5miles). The market town of Alnwick is 15 miles away and Berwick Upon Tweed 25 miles away. If travelling by public transport, the closest railway stop with easy bus transfers is Berwick upon tweed. Buses run daily to Seahouses with the nearest bus stop being in North Sunderland which is the top end of Seahouses half a mile from Springhill. Travelling South From the A1, take the B1342. Within 5 miles join the B1340 (Bamburgh). Continue 2.5 miles. Before entering Seahouses, turn right to North Sunderland (large white house on corner). Take the first right turn (0.75 miles), within 0.5 miles you will come to a T-junction (Springhill Farm). Travelling North From the A1, take the B1340 (Denwick), continue 14 miles until you reach Seahouses. Enter Seahouses past the Golf Club and turn left at the first mini roundabout. Continue 0.5 miles and turn right into Broad Road at the Longstone House Hotel. Within 100 yards, turn left. Within 0.5 miles you will come to a T-junction (Springhill Farm).